Corkcicle Wine and Beer Chiller Add to Flipboard Magazine. Have you ever wanted a really COLD beer and the ones from the fridge just weren’t cold enough? Corkcicle Wine and Beer Chiller is just what you need. Even if you just bought the beer or it hasn’t been in the fridge, the corkcicle beer chiller will chill it up for you in a snap. Its really easy. Step 1 – Freeze Chillsner for 45 Minutes. Before using, take a drink of beer to make room for Chillsner. Step 2- Insert Chillsner into bottle. Step 3 – Press firmly to create a tight seal. Note: Use caution when first inserting as some beers may foam up slightly. 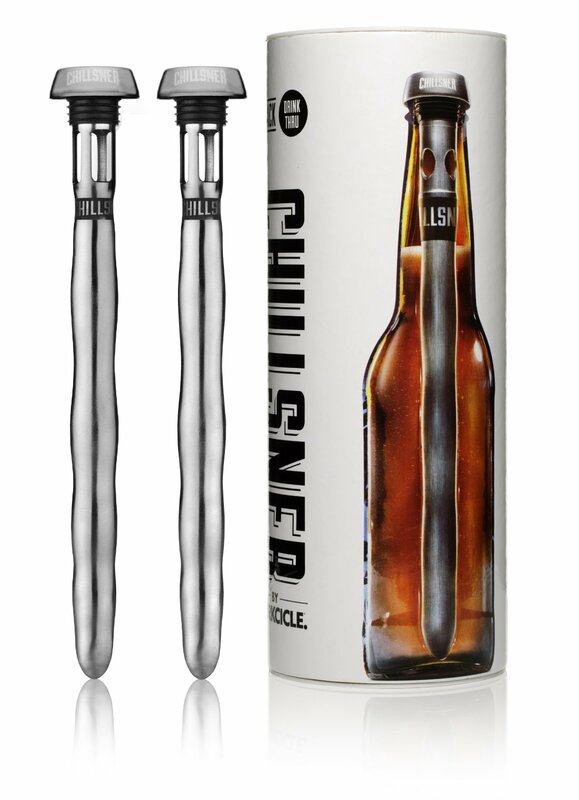 Step 4 – Enjoy the Chillsner’s drink-through feature and complete coolness. When you are done with your corkcicle beer chiller, just wash and refreeze when you are finished. So easy and simple. They come in set of two so you can share of just have a spare for the next cold beer. Perfect for wine or beer, this will become your next favorite thing for summer or winter. Everyone likes their drink to be cold when it’s suppose to be cold. The Corkcicles don’t take up much room in the freezer, so put 2 or 3 in there for the next time you reach for your favorite beer or wine. Not only will it make it cold or colder, it will stay cold for a long time. If you don’t believe me, watch the video below. That proves it with out a doubt. Watch this fun video about the Beer Chiller. Disclosure: There may be affiliate links in this post. These earnings help us keep this wonderful website going strong. Welcome to my pages of research for things I am looking for one of the grand kids or friends. All of these products are really cool and I usually want everything. OurLittlePages.com is a participant in the Amazon Services LLC Associates Program and other affiliate programs, an affiliate advertising program designed to provide a means for sites to earn advertising fees by advertising and linking to Amazon.com and other merchants websites. You should always perform due diligence before buying goods or services online. The Owner does not accept payment or merchandise from manufacturers in exchange for writing reviews. Children’s Online Privacy Protection Act Compliance: We are in compliance with the requirements of COPPA (Children’s Online Privacy Protection Act), we do not collect any information from anyone under 13 years of age. Our website, products and services are all directed to people who are at least 13 years old or older. Affiliate Disclosure: Our Little Pages is a professional review site that receives compensation from the companies whose products we review. We review each product thoroughly and give high marks to only the very best. We are independently owned and the opinions expressed here are our own.